Just wanting to share this with everyone. To see more of this artist's work, click HERE. My name's David John Beesley, a political Artist from London, England. I'm a friend of Paul Stewart, the guy from Goldmith's who was involved in Low Lives Occupy last night [#m3], Holding Knowledge Hostage. I have also been accepted onto the Masters at Goldsmith's and plan to work in conjunction with Occupy. I would lke to add some paintings to your site. The Holiday season is now upon us, and it's most definitely time for tiny-tenting! Tomorrow, Thursday, is the darkest day of the year - the Winter Solstice. For many cultures it's a festival of lights: Christmas Tree Lights, Hannukah Menorah's, Kwanzah Candles, and the like. For OWS, it's also... tiny tents! 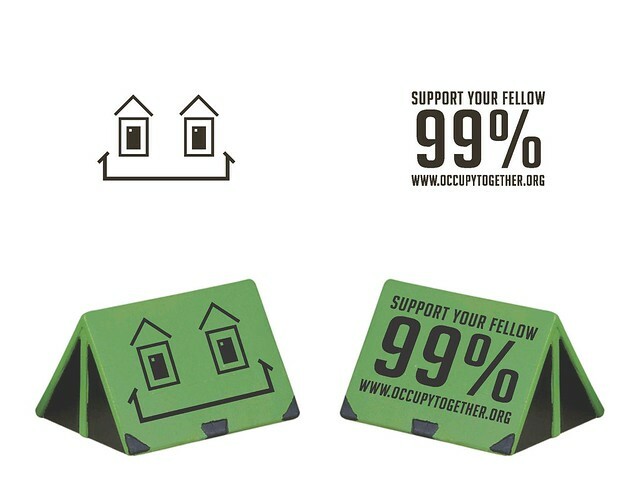 We can create little glowing structures that remind people about the spirit of justice and the warmth and solidarity of the 99%! Tiny tents are popping up all over the country- what will NYC tiny tents look like? Bring materials such as newspapers, glue, little sticks, print-outs, make your own design, we will have some materials on hand too. Can anyone bring OWS journals? Thursday 2:00-4:40 in an art studio near Gowanus. Then we'll so some tenting! Are you an artist? Can you draw? Our project is to support the Occupy Wall Street movement by making protraits of the occupants, documenting the range of participants and recording their messages, using our special skills as artists. The Occupy movement is now global. We ope to collect images from artists everywhere. Send us your art from your Occupation. Please send 72 dpi jpegs or a link to your web album to sbrzweig@gmail.com. This is a quick sketch of a mother and son. He had been in the navy for 10 years, he's now in the reserves. He said, "People in the military are just like everyone else-- we know the difference between right and wrong." His mom looked on as passerbys eagerly engaged him in conversation: "I was a single mom," she said. I must have raised him right." OccupyWall Street, Oct. 15. Andrea Kantrowitz. On November 7, 2011 artist Katherine Gressel took to Liberty Plaza to paint what she sees around her. On November 6st, 2011 Dutch artist Erik Van Loon will install his 7th “I Will Win” painting ‘I Will Win 7 - The Crisis" along the course of the NYC Marathon to approximately 40,000 runners and 260 million TV viewers in 125 countries. We are part of the 99%! Thank you for reading this. Both are done in red, white and blue (with flag images) on cremation urns are political satire.